On September 30, 2011 Anwar al-Awlaki was killed in an American drone strike. Awlaki’s death marked a new step in America’s approach to the war on terror – the targeted killing of an American citizen. 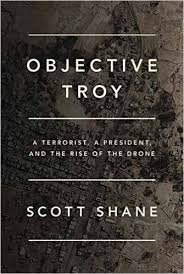 In his new book, Objective Troy, New York Times reporter Scott Shane tells the gripping and unsettling story of Anwar al-Awlaki, the once-celebrated American imam who called for moderation after 9/11, a man who ultimately directed his outsized talents to the mass murder of his fellow citizens. Shane follows Barack Obama’s campaign against the excesses of the Bush counterterrorism programs and his eventual embrace of the targeted killing of suspected militants and recounts how the president directed the mammoth machinery of spy agencies to hunt Awlaki down in a frantic, multi-million-dollar pursuit that would end with the death of Awlaki by a robotic technology that is changing warfare—the drone. Scott Shane has covered terrorism as a national security reporter for The New York Times over the last decade. New America is pleased to welcome Mr. Shane for a discussion of his book. Follow the discussion online using #ObjectiveTroy and following @NatSecNAF.